I don’t have any building architecture for you today, but I do have some knitting architecture, sock architecture to be precise. 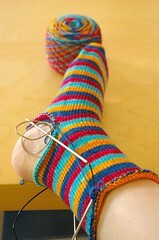 A sock is made of various parts, toe, foot, heel, leg and cuff. These parts can vary from one pair to the next. 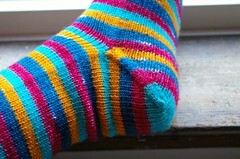 Some socks have ribbed cuffs or picot cuffs, some have wedge toes or star toes. Some have heel flaps and some have short-row heels. You usually work the heel after working the leg or the foot, that’s standard architecture, just like you would paint the walls after putting the sheet rock up and before putting picture frames up. But sometimes you can play switcheroo and do things in a different order! And that’s what I did with this sock. I’ve been pretty lucky in the past with my self-striping socks and never had too much trouble with the stripes when I did my short-row heels, but this time I wanted to try something new, the afterthought heel. 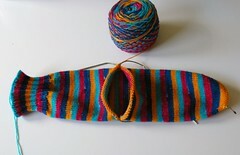 So I cast on for my toe, then knit the foot, then knit the leg and the cuff. I think I forgot my heel! 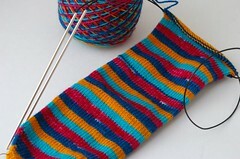 No, I didn’t forget my heel, I knit in a piece of scrap yarn where I wanted my heel to be like in these instructions. You could very well do an afterthought heel after forgetting the heel for real, you’d just have to pick up stitches and actually cut the main yarn, but I’m not quite that daring. See the blue yarn between the turquoise and the orange? After getting far enough into the leg I needed to try on the sock for fit and length, which you can’t really do when you sock is just one plain tube. So I proceeded to put the heel back on needles and removed the scrap yarn. After finishing the leg and the cuff (which actually fit to my greatest surprise) I went on to start knitting on my heel. I had to pick up quite a few stitches to make sure that the joints were solid enough. I managed a fairly nice joint on one size but not so nice on the other. Then I just decreased like if I was doing a regular wedge toe. I ended up decreasing to fewer stitches than if I was doing a regular short-row heel but it fits quite well. 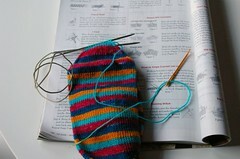 Of course, since I had a toe (heel) to knit I also had a toe (heel) to kitchener. Which means that I had to get my trusty instructions out… I mostly do toe-ups so I kitchener very rarely. After kitchenering and weaving in my ends (2 more than a regular toe-up or top-down sock because of the heel) I had a finished sock! The heels look nice and stripy and don’t interrupt the stripe sequence. Would I do it again? Not sure, maybe only if I were sure the stripe sequence was going to be totally out of whack with a regular short row heel. 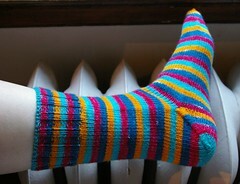 If you want a cool sock architecture, I would suggest trying this one out, the Houdini Socks by Cat Bordhi on the new Twist Collective. Now that’s really cool, an afterthought leg! Thanks for demystifying this technique! Thanks for the progress shots of how an afterthought heel works. Very interesting! that was a weird heel knit but looks great! 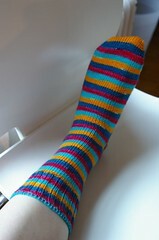 that is one fantastic stripey sock! The sock looks great! Can you feel the decrease ridges when you wear the sock?